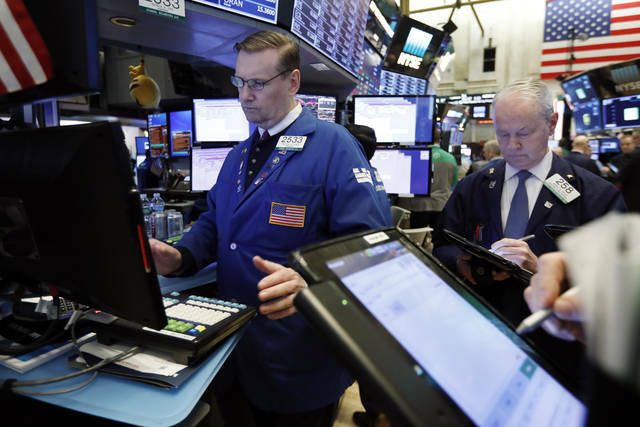 NEW YORK (AP) — A mixed bag of corporate earnings nudged U.S. stocks slightly lower Wednesday, snapping the market’s five-day winning streak. Take-Two, maker of the “Grand Theft Auto” and “Red Dead Redemption” games series, gave investors a weak outlook for the current quarter. Electronic Arts, whose titles include “The Sims” and various sports games, including “Madden NFL,” flagged disappointing results in sales of its latest “Battlefield” game. Take-Two and Electronic Arts plunged 13.8 percent and 13.3 percent, respectively. Activision Blizzard, maker of the “Call of Duty” and “Candy Crush” games, fell 10.1 percent. The company behind the popular photo-messaging app SnapChat surged 22 percent as advertising gains drove revenue growth in the fourth quarter. The revenue increase helped cut the company’s losses. It also maintained its user base. The New York Times vaulted 10.3 percent in heavy trading after the newspaper publisher touted a big gain in digital subscribers and digital revenue for the October-December quarter. The Times added 265,000 digital subscriptions in the fourth quarter. Its earnings and revenue topped Wall Street’s forecasts.